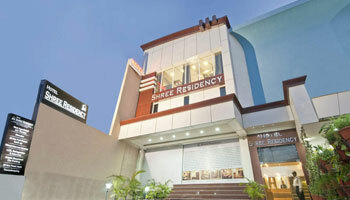 Hotel Shree Residency" is a contemporary & vibrant hotel, designed to suit the needs of frequent business travellers & leisure tourist. It offers a range of services and amenities to make itself the most preferred choice to its guests. This hotel is adequate in catering to the need of today's trendy business travellers, offering value-for-money accommodation with modern 3 Star facilities without any compromise on quality, at extremely affordable prices. The hotel enjoys an excellent location being strategically located on the main Delhi-Kanpur Road in close proximity to all posh residential colonies & commercial hub of Agra. It is near to markets, malls, multiplexes and has wide selection of restaurants and bars making its place in one of the most developed nodes of the city. Security Guard, Parking, Breakfast Services, Airport Transportation, Room Service, Doctor on Call, Backup Generator, Laundry Facilities, Travel Counter, Currency Exchange. H/C Water, DVD Player, Iron/Ironing Board, Wakeup Calls, Cable/Satellite TV, Air Conditioning Room, House Keeping, Attached Bathroom, Toothbrush/Razor on Request.